Over and two and a half decades later, the events surrounding the protests in Tiananmen Square in 1989 are suddenly being brought up in relation to the US presidential elections. 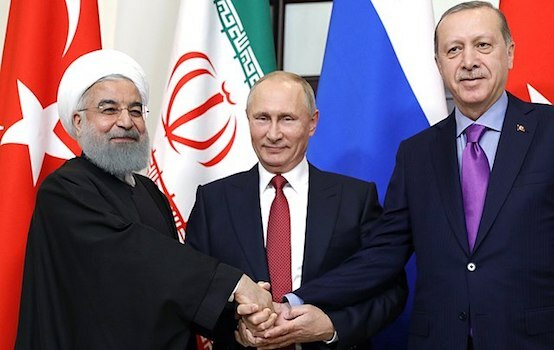 The way in which the events are now being discussed sheds light on the way western media presented the events at the time, and also provides deep insight into the psyche of the American people. The events in Beijing in 1989 were deeply tragic; many people lost their lives. However, the narrative of exactly how these tragic events took place, and how that was promoted in the mainstream western media at the time, has been largely de-bunked. Both Clinton and Trump accept the disproven narrative of the Tiananmen events in 1989. However, they differ on interpreting it. Among psychologists, the concept of projection is described as when people “defend themselves against their own unconscious impulses or qualities…by denying their existence while attributing them to others.” The confused and distorted narrative of the 1989 events, especially as it re-emerges in the 2016 elections, is a great example of projection. Liberals and conservatives in US politics both look into the Tiananmen events as if they are unknowingly glancing into a mirror. They describe an unconscious perception of themselves, highlighting some of the uglier aspects of their personalities and worldviews. The mainstream media narrative is rather simplistic. The way the US public understands the 1989 events, thousands of peace-loving Chinese college students gathered in the capital to demand that their political and economic system become closer to that of the United States. The story portrays the students as Ghandian pacifists who sang John Lennon songs and meditated. After a month and a half of occupying the square, western media tells us that the Chinese military forcibly ended the protests by ruthlessly running the students over with tanks. The first projection within this false narrative is the stated goals of the protesters themselves. According to reports that have come out after 1989, other than be united around the single word “democracy,” the protesters had a wide variety of causes and beliefs, some of which would be highly unattractive to westerners. In Chinese political discourse, raising the slogan of “Democracy” is not necessarily an endorsement of western capitalism. The fact that a number of protesters were “hardliners” who believed themselves to be the true successors of Mao Zedong and sought to revive the policies of the Gang of Four, does not fit into the fantasy of Hillary Clinton and other liberals. The fantasy of western liberals is even more thoroughly debunked by the obvious fact that a large percentage of the student protesters were motivated by racism. In January of 1989, just several months prior to the Tiananmen protests, Chinese Universities were swept with protests against the presence of African students. In Nanjing, a full scale race riot took place. The over 40 African students studying in Nanjing took refuge in a “government house” as mobs of Chinese students chanted “Down With Black Devils” and “Honor Human Rights.” The riots went on for two months after students became angry that some of the male African students had begun dating local Chinese women. 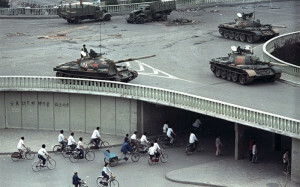 In the months prior to the Tiananmen Square protests, students in Beijing joined the wave of violent anti-African protests, according to the New York Times. The same student organizations that occupied Tiananmen Square a few months later had also boycotted classes opposing the presence of 500 Africans on their campuses. Riots and fights erupted across Beijing and many people were arrested. The African students living in the Chinese capital feared for their lives. The slogan used in the Anti-African protests was “Honor Human Rights.” This slogan was also used by the “Democracy” protesters in Tiananmen Square. In such situations, a wide variety of political forces can be duped into getting involved, somehow weaving their own specific grievances into it. Meanwhile, the political forces that the CIA is looking to advance can maneuver in the background, preparing to seize power, while the vaguely defined “revolution” often centered on a color like “Green” or “Orange” is grabbing all the media attention, and clashing with the police and military. The fantasy that these protesters were idealistic believers in western liberal democracy who were passively crushed by tanks is a liberal dream rooted in Protestant Christianity. The brand of Protestantism that settled New England, and is continued to this day by the United Church of Christ, the American Society of Friends, the United Methodist Church, Unitarian Universalism and other non-evangelical Protestant traditions has a particular obsession with “bearing moral witness” and “speaking truth to power.” Its adherents interpret the story of Jesus Christ crucifixion almost as if it were a political act of civil disobedience. While many different religions emphasize martyrdom and sacrifice, the Protestant sects that settled the northeastern United States had a particular obsession not just with pacifism, but with inducing their own suffering. The concept of the “Protestant work ethic” is rooted in a widespread notion among these religious groups that suffering was inherently good, and those who suffer the most, and restrain their impulses most effectively, are the most moral. Many scholars have noted that Martin Luther King Jr.’s use of pacifism and non-violence was very effective in terms of public relations. King’s white allies were primarily among the New England wing of the Democratic Party, deeply influenced by this school of religious thought. The fact that King proclaimed non-violence ad nauseam and won the sympathy of mainline Protestants made it less possible for southern racists to outright slaughter civil rights marchers. Hillary Clinton is officially a member of the United Methodist Church, one of the largest mainline Protestant congregations in the US. The United Methodist Church is deeply liberal on many social issues, and often caught flak from the John Birch Society in the 1960s because of its “social justice” oriented ministries. Despite Bill being a Baptist and Hillary being a Methodist, when the Clintons first occupied the White House, the first family selected the prestigious Sidwell Friends School, an observant Quaker academy in Bethesda, Maryland for their daughter Chelsea Clinton’s education. While Chelsea Clinton was getting a protestant pacifist education, being taught to listen to the “light within her” and “discern” about what is right, her father was bombing and killing thousands in Iraq. Two years after she graduated in 1997, Clinton destroyed Serbia with NATO bombs. Just like William Penn’s slaughter of the Native Americans, or Nixon’s ruthless escalation of the Vietnam War and bombing of Cambodia, the “pacifism” of Quakers and other New England Protestants seems to be widely open to interpretation. It is likely, however, that many of Chelsea Clinton’s pious educators were the kind of people who frequently fantasize about laying themselves down in front of Stalinist tanks. The American mind has projected this image of pacifist martyrs who were mercilessly crushed as they proclaimed the ideals of liberal democracy onto the Tiananmen events of 1989. If Hillary Clinton or the staff of Sidwell Friends School ever met the Tiananmen Protesters, they would probably not get along with each other. Maoist hardliners and anti-Black racists don’t have much in common with American liberal Protestants. In the mythology of how the 1989 protests ended we find yet another projection, this one from the US political right. After the Tiananmen Square protesters reached an agreement with the military and peacefully dispersed, there was indeed a lot of killing. Hundreds of people were killed during the protests aftermath, and among those killed were at least a few People’s Liberation Army soldiers who died from gunshot wounds and stabbings. The Chinese government reports that 300 people died in total, half of which were soldiers, not civilians. Other estimates of how many Chinese soldiers died range between 12 and 200—after the square was peacefully cleared, when armed battles took place across Beijing. The Washington Post described an organized group of 100 to 150 people armed with chains, Molotov cocktails, and clubs and carefully organized into squads of five. Cars and public buses were torched and gunfire was exchanged between the military and other forces. Among those confirmed dead was Pvt. Zang Lijie, who was shot by gunfire from within the apartments where foreign diplomats were living. Another soldier, Cui Guozheng, was stabbed to death on a pedestrian bridge. Six People’s Liberation Army soldiers died when their truck was flipped and caught on fire. 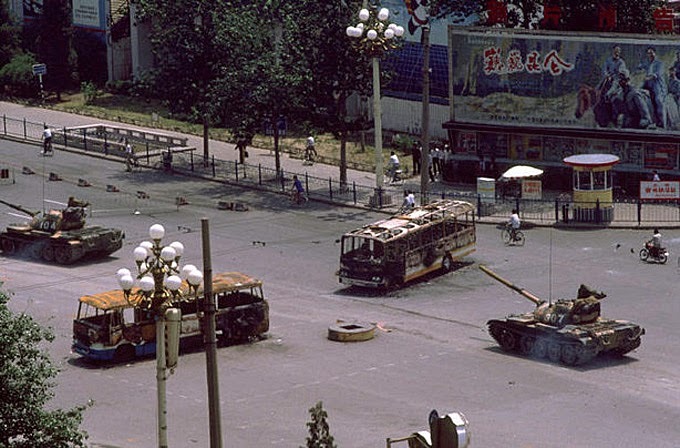 It’s not exactly clear who the people shooting at the Chinese military, burning cars, or engaging in other acts of violence in the aftermath of the Tiananmen protests actually were. There were widespread rumors of clashes between different People’s Liberation Army units, and the Chinese government acknowledges that widespread insubordination took place within the army’s ranks. The possibility that a coup d’etat was attempted during the protests would fit the “color revolution” playbook. Throughout Eastern Europe, the various Marxist-Leninist governments were overthrown—all while peaceful protests were the media’s main focus—and pro-western sections of the military and party elite moved in the background, utilizing the chaos in order to seize power. The western media’s story that the Chinese government slaughtered all the peaceful protesters in a fit of tyrannical rage is obviously untrue. The students agreed to peacefully disperse according to multiple eye-witness accounts, and afterwards, there were days of pitched battles in the streets of the Chinese capital, in which hundreds of people, soldiers, and civilians were killed. The version of events repeated by Donald Trump where, “the Chinese government almost blew it. Then they were vicious, they were horrible, but they put it down with strength” sounds a lot like a very common right-wing political fantasy during the post-Vietnam era. The year 1989 was a prime moment in US history for such right-wing fantasies. The Reagan Presidency, which was seen as a repudiation of the 1960s “New Left” had just concluded. Stories about how anti-war activists had “lined up to spit on” Vietnam war veterans were widely circulated and believed at that time. The idea that “protesters” are immoral human beings who deserve to be slaughtered was a popular sentiment among right-wingers in the United States following widespread protests of the Vietnam war. Many Americans came to believe that the failure of the US in Vietnam was the result of a “stab in the back” from the political left that sabotaged the war efforts. Though WikiLeaks and other eyewitness accounts confirm that the Chinese People’s Liberation Army did not randomly open fire into the peaceful crowd assembled at Tiananmen Square, when such a thing was done by National Guardsmen and police in the United States, many celebrated it. At Kent State University, the National Guard opened fire on a crowd of anti-war protesters on May 4th, 1970. Four youth were killed, two of which were random students, not peace activists. In its reporting on the legacy of the Kent State Massacre of 1970, National Public Radio was told that “they should’ve shot them all… was a common response” in right-wing parts of the United States. () According to an article in the Journal of Psychology published in 1980, residents of Kent, Ohio would greet each other by waving four fingers in the weeks following the famous massacre of protesters. The waving of four fingers was accompanied by the repeating of the phrase “we got four,” a celebration that four anti-war activists had been killed. Historian William A. Gordon, author of the book “Four Dead in Ohio” described the killing of four students in Kent, Ohio as “the most popular murders ever committed in the United States.” He writes that many right-wing conservatives were jubilant about the fact that “traitors” had been shot. The belief that the massacre at Kent State was the only time peaceful protesters were fired on is a common misconception of US history. Two years before Kent State, the local police and state troopers in Orangeburg, South Carolina opened fire on a group of civil right marchers who were protesting against a segregated bowling alley. Three of them were killed. Almost a year prior to Kent State, a student named James Rector was shot by National Guard troops in Berkeley, California during the “People’s Park” protests. In the weeks directly following the Kent State Massacre, two African-American students were killed at Jackson State University after the police and state troopers opened fire into their protest with live ammunition. It seems to have been a widespread belief among right-wing Americans of the Cold War era, that the killing dissidents, especially those who engaged in non-violent protests, was a good idea. Academy Award-winning filmmaker Michael Moore recalls how many of his fellow Catholic parishioners in Michigan applauded when news of the assassination of Martin Luther King, Jr. was announced in the church parking lot, following the Thursday evening mass. The conservative sector of the US public in 1989 probably contained millions of human beings who fantasized about killing “hippies” and “protesters.” The false narrative that Chinese troops ran them over with tanks or “shot them all” is a projection of these impulses on to the Chinese Communist Party. It mirrors the liberal projection that the crowd of anti-African racists, Maoist hardliners, and other confused adherents to some interpretation of the word “democracy” were actually western liberals and pacifists. Regardless of how many times the Tiananmen narrative is refuted, western media continues to repeat it. The words of Nicholas Kristoff, James Miles, the Chinese government, and the eyewitness accounts of Chilean diplomats are merely ignored. An event that was far more complex, involving lots of confusion and violence on both sides, has been retold to western audiences as some kind of classical tragedy, and the reality of what occurred is not even acknowledged. The man in front of a tank is a rallying cry for the ideology that has overtaken the United States and Western Europe. In western societies if one is passionate or well informed about politics, one is declared to be “brainwashed.” The truly free western liberal lives in a world of cynicism and pragmatism, where right and wrong are always negotiable, and abundant selfishness is tolerated. “Think for yourself” has become a euphemism for not thinking at all, i.e. not joining “the mob” of individuals who come together, agree on ideological principles, and fight for them. 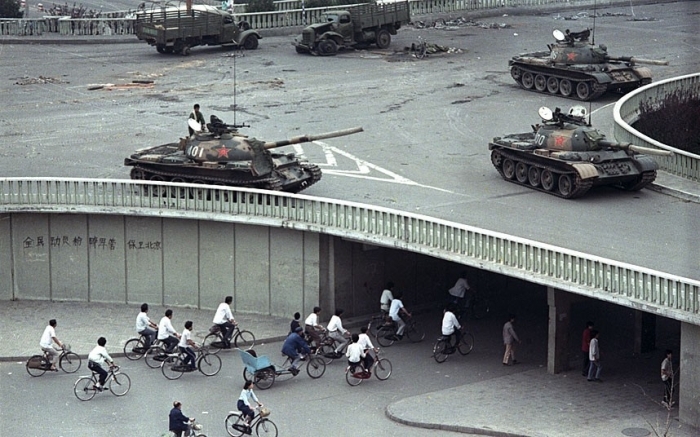 The mythology of Tiananmen is very important for believers in western capitalism. It is something they can point to as proof that “China is just as bad as we are.” They can insert the false narrative of events in China into their understanding of cruelties and savagery of their own society. They can believe that China and the United States are, at heart, the same kind of system, and that “human nature” naturally produces inherently greedy and tyrannical beings in every circumstance. What actually happened in Beijing in 1989 is far too complex for many Americans to comprehend. It’s a story of chaos and confusion in which the Chinese state swung into action in order to prevent what happened in the Soviet Union, Czechoslovakia, Hungary, the German Democratic Republic, Romania, Estonia, Lithuania, and Poland from happening on their soil. By mid-summer in 1989, when things were once again calm in China’s capital, the Chinese Communist Party was still in charge. 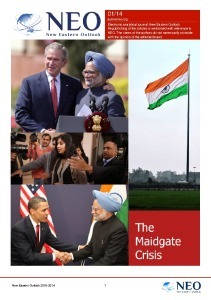 This remains the case two and a half decades later.